Well…. it’s been a while since my last post. And in my world of food, things have changed tremendously since my last recipe. As some of my last few posts have indicated, I had to switch over to a very restricted diet for some time (with the occasional slip for worthwhile goodies like Sharm’s Homemade Pumpkin Pie with Gingerbread Crust). But I’ve emerged on the other side of that food-free hell, armed with new research about health and diet and tons of new food combinations. And while I still love the taste of dairy, meat, and some processed foods, I’ve learned a lot (not necessarily by choice) about how these foods affect my sense of well-being. There will be lots more to come in future posts, including recipes that avoid most allergy-causing foods. More importantly, I’ll be discussing how I discovered my food allergies and sensitivities (basically, lots of trial and error, but also employing some organized strategy), and how you can easily modify your own diet to improve your health. For instance, modifying my diet has improved my energy and significantly decreased the frequency and severity of health issues from which I’ve suffered most of my life but with which I have only recently been diagnosed as being actual conditions. As I’m fairly sure is quite obvious, I’m a glutton, and nothing about that has changed. I’m just trying to be a… healthier glutton. One major factor that positively affected my diet was the decision to go vegan for Lent, as is the tradition in my church. I had never done it before, and I knew from past experience(s) that Lent was probably the only way it was going to stick for more than a week. I mean, just look at my past recipes. Lots of frying, lots of dairy, lots of fat. Lots of deliciousness. I was not expecting to enjoy this change, at all. And I’ll admit, there are days when the only thing standing between me and a Popeye’s binge is my commitment to Lent. But, all in all, I’d say the experiment has been a tremendous success, and in conjunction with some Eastern herbs I’ve started taking, I have noticed a boost in my energy levels and mood and a significant decrease in pain, heartburn, fatigue, insomnia, and other symptoms I have been suffering for many years. I’ve also dropped a few pounds (which might also have something to do with beginning Kenpo Karate at roughly the same time). The one caveat is that I allow myself Sundays off (it’s legit–check it out), and I do think that this has made the experience that much better and easier to manage. Am I suggesting that everyone do what I’m doing? No. But I do think it’s worth researching to see what might work for you. If you’ve been wanting to lose a few extra pounds, cut down your cholesterol, have digestive issues, or have always just wondered if you could do it, then read on. If you just want to incorporate more veggies in your home menu, this should work for you, too. I would definitely recommend anyone considering trying out vegetarianism, or veganism especially, to allow for the fact that you’re human, and you’re likely going to falter. So give yourself a day off here and there, so that you’re not trying to sprint a long distance marathon. 1) Vegans tend to be healthier. Less arterial clogging, cholesterol issues, gallbladder problems and other digestive disorders, etc. More energy. Bonus feeling of moral superiority. 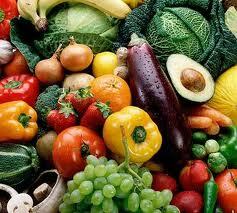 2) Vegan (or mostly vegan) diets aren’t as difficult to maintain as one might think. Sure, it takes some creativity, but once you get the hang of it, conjuring up entirely veggie meals is actually pretty easy. And can even be very fast on a weekday, if you stock up well at the store. 3) You’re not going to pass out from a lack of protein. Further, our bodies are surprisingly pretty well equipped to cope with the lack of animal proteins. One misconception I had was that I had to combine protein and carbs in every meal. Wrong. Our bodies can hold onto the proteins and store them for when we need them. There are even vegan Olympian athletes out there writing vegan cookbooks. The only real concern for vegans is Vitamin B12, which will be addressed later. So basically, as long as you’re alternating a varied diet, you’re golden. 4) You don’t have to eat fake meat. One of the biggest turnoffs about veganism for diehard meat eaters (like myself) is the idea that tofu and other types of veggie protein are supposed to replace meat. Well, let me tell ya, it probably ain’t gonna happen. They are generally nothing alike. Although I did recently have some Gimme Lean “fake” sausage that, when simmered in olive oil, spices, and sun dried tomatoes, tasted pretty much exactly like meat. Anyways, the point is that there are plenty of options that are based on meaty vegetables such as eggplants and tomatoes. Beans can also lend an almost cheesy taste to some dishes. Many people don’t miss the taste of meat at all after a while. 5) There are plenty of global cuisines that center on vegan or nearly-vegan ingredient combinations. South Asian, Southeast Asian, Latin American, Middle Eastern, Mediterranean, and various African diets are great at incorporating wholesome, relatively unprocessed ingredients into delicious meals. Curries, stir fry, falafel, tacos, foul, tabbouleh, hummus, and endless uses for avocados, coconuts, bananas, and plantains are just a few options when thinking vegan. Most (though not all) of these culinary traditions stem from cultures that tend to consider meat an occasional delicacy, but not off limits. So lots of veggie options, although even they have cheat days. When considering what will work for you, just remember that Rome wasn’t built in a day. I have tried a number of times before to go vegetarian or vegan and have fallen flat. Easing into it is so much easier. I’m not going to lie–living in the US also makes it easier than, say, a former Soviet republic, where the fancy alternatives that Westerners rely on might be in limited supply or cost prohibitive. Right now, I have the fake meat to fall back on if I want it, almond milk is as cheap as soy milk, which is also as cheap as regular milk (and all are delicious and vitamin fortified), and the shelves at the store are stocked with foodstuffs from literally all over the world. That said, it so happens that I’ll be moving back to Armenia in the near future, and I am determined (for health reasons, if nothing else) to maintain some version of my current diet. Should be interesting, considering how miserably I failed at being a healthy vegetarian the last time I lived there. In any case, having a plan–one, two, or six vegan days a week, for example–will help to make your foray into veganism successful, if you choose to try it. There are plenty of reasons to make the switch–health, as mentioned above; the obvious animal welfare factor; environmental reasons; and even cost (although this can vary by region). And even though I’m not a seven-day-a-week vegan, I know my choices are making a difference on multiple levels. Which is good enough for me.